US, 2005, 93 minutes, Colour. Charlize Theron, Marton Csokas, Jonny Lee Miller, Sophie Okonedo, Frances Mc Dormand, Pete Posthlethwaite. Director Karyn Kusama previously wrote and directed a film about female boxing, Girlfight. That gives her some qualifications for this action drama where the heroine, Aeon Flux (also known as Catherine) has to take on many enemies in choreographed conflict. She is played by Charlize Theron, relying here on statuesque glamour rather than her subdued plainness as in Monster and North Country. Perhaps this film has come too late in the day to make the impact it might have some years ago. Audiences have seen plenty of such futuristic stories – many of which were clearer to follow and brighter to look at. It follows familiar plotlines and relies on the interest in speculations about the future of the human race and the action. The setting is several centuries hence and plague has decimated populations. Women are barren, so scientists are heavily involved in cloning procedures. In fact, most of the people seem to be clones – but there are signs of breakthrough and an ordinary human future. Aeon belongs to a group of rebels controlled by Frances Mc Dormand. When they are sent on a mission to destroy Trevor Goodchild, the head of the industry, Aeon finds she is reluctant to kill him. Relying on her friend and sparring partner Sithendra (Sophie Okenedo), she discovers the (expected) treachery of Goodshild’s younger brother, Oren, (Jonny Lee Miller). The expected battle lines are drawn. Trevor turns out to be more than a Goodchild and Oren is the bad child. And the film ends with hope for humanity again. The film is based on a series of comic books. 1.The popularity of futuristic science fiction films? New civilisations? Collapse of civilisations? Government and power? Bioethical issues? 2.The comic book origins of the film? Transferred to the big screen? The screen narrative? 3.The female hero, the tradition of Catwoman and Lara Croft? 4.The visuals of the futuristic city, the buildings, the surroundings, the environment? Imaginative? Costumes and décor? Atmospheric score? 5.The special effects, the stunt work? The fights, the leaps, the flights? The weapons? 6.The title, the focus on the heroine? Katherine in another time and place? The time change? The background of cloning? 7.The plague, destroying the world, the disaster for human beings? The changes in nature? Birth? Science? The manufacturing of clones? The search for a cure from the plague? The sense of humanity – and inhumanity as it was mechanised? 8.Society and the future, the voice-over, seeing people disappear suddenly into corridors and niches? The murders? The motivation? The Monican revolution? The rebels, their appearance, costumes? The control and the handling of the people? The missions? The special powers, psychological, telepathic? The skills with weapons? The characters as mutations with beyond human qualities and powers? 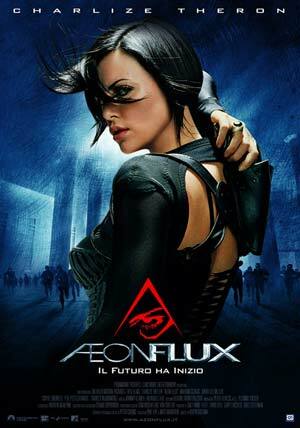 9.Aeon Flux and Charlize Theron, her appearance, clothes? Her life, her power, with the handler? Her memories and lack of memories? Belonging to the rebel team? Her love for her sister, the meal, her sister’s death? Motivation for revenge? Antagonism towards Trevor Goodchild? Sithandra and her friendship, partner, the combat practice? The control urging Aeon Flux to confront Trevor Goodchild? 10.Her skills, the fighting sequences, her infiltrating into the Goodchild empire? Her hesitations when confronted by Trevor? Her ambiguous memories? Sithandra and the orders, control and the orders? Her saving Trevor? 11.The person and personality of Trevor Goodchild? His place in the council, his power? His working on cures, a more benign personality than audiences were led to think? The confrontation with Katherine? Memories of his wife? The bonds between Trevor and Aeon, their relationship? His relationship with his brother, Oren and his leading the rebellion? 12.Oren and his plans, the rebels? His being thwarted by Aeon? The murders – and his confession to the murder of her sister? The flashbacks? The Keeper and Katherine? Her meeting him again? The confrontation? The build-up to the guards, the battle, the deaths? 13.Aeon and Sithandra, the change in their relationship? Trying to persuade Sithandra of the truth? Freya and her role in the defence, the rebels? The decision by Sithandra to save Aeon Flux? The troops and their deaths? Freya and her loyalty? Serving, fighting, dying? 14.Trevor and Aeon, the dangers, his being wounded, the escape? 15.The Keeper, his appearance and clothes? Age, his role in the past, saving Aeon – and providing for her future and a child? 16.The issues of the future, the inability of humans to give birth, the seeking for cures from disease, the cloning, the exercises of power? Fighting, deaths? The future of humanity?